Another Penny Black card – LOVE! Hello! Welcome back. Today’s card share is one of my favourite card I made using Penny Black stamp sets. 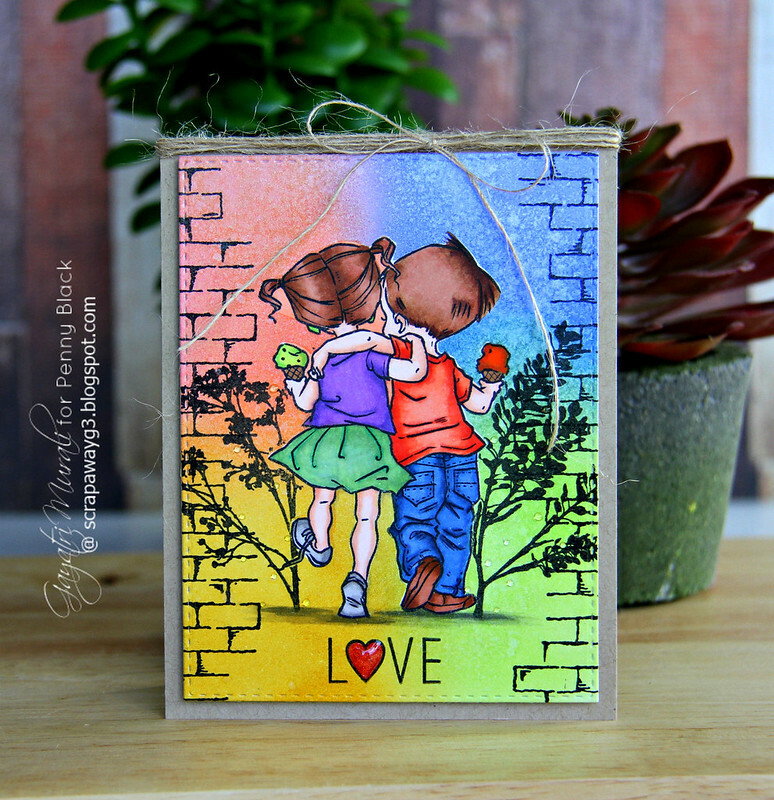 I have used the new release stamp set called Summer Love from Penny Black. I ADORE this image both the boy and girl arm in arm with ice cream in their hands. Absolutely adorable! So I stamped the image on a white card panel. Then made a mask of this image by stamping the image on masking paper, cutting out the image. I masked the original image using the mask. Then sponged Abandoned Coral, Mermaid Lagoon, Fossilized Amber and Twisted Citron distress inks around the image. I sprayed some clear shimmer to add texture and shimmer to the background. I then stamped the bricks on either side of the image using an older Penny Black stamp set called Brick Wall. Similarly I stamped the two foliage on either side of the focal masked image in black. The foliage are from an older stamp set called Sprigs. I then removed the mask and coloured the image using copic markers. I also grounded the image and foliage using grey copic markers. The sentiment is from a new release stamp set called Critter Love. I coloured the heart shape in the sentiment with red and pink glitter pen and added some glossy accent. This is all one layer. I die cut this panel using a stitched rectangle die and adhered the panel on to a kraft card base using craft foam. For more texture, I wrapped a jute thread around the top of the card base and made a bow. Finally added a few drops of glossy accent here and there for added texture and interest. 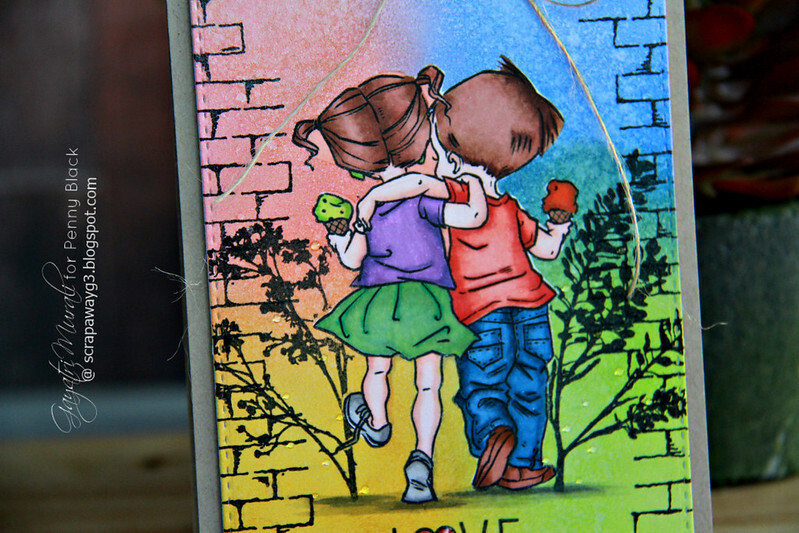 Love the colours, depth, texture and the adorable scene on this card. Thrilled that I was able to put my thoughts exactly on paper. Penny Black stamp sets have so much detail to their designs. LOVE it! More of the Valentine’s Day Penny Black designs are available for purchase from Penny Black store.